Out of all my research conditioner has turned up as one of the most harmful of all the products we have looked at thus far. Even the children’s conditioners and some of the organic ones have shown cancer risks. Marianne Kapfer, a librarian in Washington, D.C., likes a natural look. She doesn’t wear much makeup but loves to indulge in a good shampoo and conditioner. When she started reading labels more closely, however, “I realized that my ‘natural’ shampoo wasn’t so natural,” Marianne says. And that’s not all. Due to labelling loopholes, many ‘natural’ and ‘organic’ personal-care products contain hazardous chemicals, some of which, at high exposures, have been shown to cause cancer, birth defects, damage to nervous and reproductive systems and liver damage in lab animals. Sadly, you cannot assume that a conditioner that says it’s ‘natural’ or ‘organic’ is safe. You either need to know your ingredients really well and scrutinise the labels or simply stick to ingredients from your fruit bowl or refrigerator. A great guideline is – if you won’t eat it don’t put it on your body. You skin absorbs everything so there is little difference between what you put into your body and what you put onto your body. Either way it is absorbed into your blood stream and distributed throughout your body. 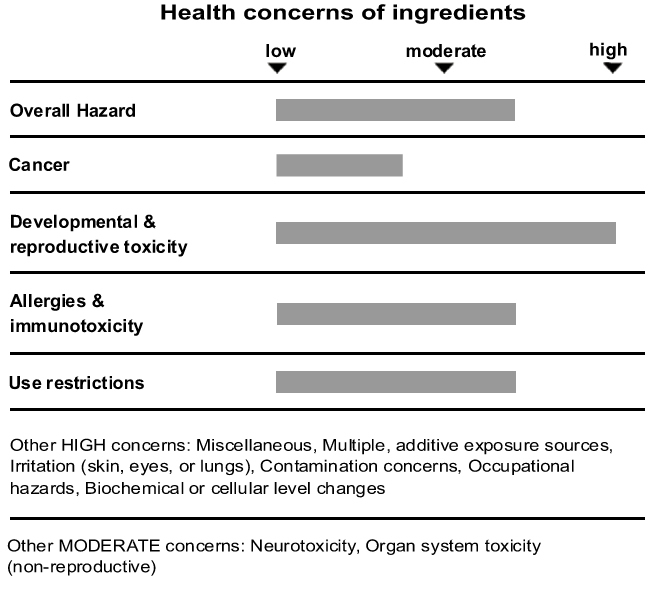 The following table shows the health concerns based on commonly used conditioner. Vinegar is the best conditioner and hair detangler. I have tried all sorts of natural conditioners but keep coming back to plain and simple white distilled vinegar. It’s cheap and works amazingly well on the whole family. The only thing I would say it that it does burn your eyes or open wounds. Take special care when using it on children as you don’t want to burn their eyes. The results are fantastic though, it cures dandruff and an itchy scalp and leaves you with a brilliant, natural shine. Another great alternative to vinegar is lemon juice. This has a similar effect to vinegar without the vinegar smell. These acids strengthen the hydrogen bonds in hair protein and help seal the outer layer of the cuticle. Lemon juice however, will lighten your hair over a long period of time where as vinegar will not have the same effect. Lemon juice is also great for washing your face, so you can allow it to run onto your face and do two things at once, but we will get to that in the next chapter. Method: Pour undiluted distilled white vinegar into your hair. Massage gently into your scalp and rinse well. Mix the Guar Gum into a paste by slowly adding small amounts of water. Once all the gum is mixed together slowly add the rest of the water. Next add the oil and either whisk or shake the container until the oil is mixed well. Store this conditioner in the fridge for us up one month. Use as conditioner and either rinse out or leave in. Apply to washed hair, leave it in for five minutes and then rinse. Alternatively, rub a small amount of Aloe Vera gel into your hair as a leave in conditioner. • Mix equal parts of honey and water. Work the mixture through your hair and then rinse with warm water. Several rinses may be necessary to remove the honey but the result will be incredible soft and silky hair. Manuka honey is best and it has been said that it can even help with hair loss problems by rejuvenating the scalp and encourage hair growth over time. After shampooing, pour the beer through your hair and let it sit for a few minutes. Massage your scalp gently and make sure the beer touches the roots of your hair. Rinse very well or your hair will smell like beer. The proteins and sugars in the beer will strengthen the keratin in your hair and give it a fantastic shine. To get rid of the shine you could give your hair a rinse with an essential oil or boil some mint in some water and when it has cooled rinse you hair with the minty water. Towel dry your hair and then shake the coconut milk before you use it as it usually comes separated. Pour a little coconut milk into your palms and work it through your hair. Be careful not to use too much as your hair will go greasy. It is a bit messy to apply though, so do it over a sink or before you get out if the shower. If you have any conditioner recipes that work well, please share them with us. Find out more about Nature’s Way here. I've been using vinegar for 2 weeks now. I have horribly dry hair. Its also long and curly so I stopped shampooing years ago and just used conditioner. My hair was always still dry but not so frizzy. Then my family moved to Germany, the water is extremely hard and the condition expensive. I heard about the vinegar substitute and tried it. I am amazed! Usually, if I get my hair wet and don't put anything in it, I can't brush it. It tangles and sticks together and puts Medusa to shame. Since I started using the vinegar, I can actually brush my hair wet. It's even better than with conditioner. My hair is soft and feels great. Its still dry and tangles underneath,(it is long curly hair after all) but not near what it was. I'm using it on my daughter, who has even longer but straight hair. It's been great for her hair as well. I've been using 1 part vinegar/3 parts water and then rinsing well. I'm still experimenting with the portions but I'm not going back to conditioner. I am so pleased vinegar is working out so well for you Maggie. I use it on my children too and it has done wonders for their hair.